Cartilage is a specialized dense connective tissue. (i) It bears the weight of the body and plays an important role during the growth in length of long bones. (ii) Gives support to developing organs. (iii) Cartilage helps in withstanding bending and torsional forces. (a) Appositional growth – by surface deposition from the cells of inner perichonchial layer. (b) Interstitial growth – by the multiplication of cells situated within the matrix of the cartilage. 1. Cells of the cartilage : The mature cartilage consists of cells called chondrocytes, situated in spaces of the matrix known as lacunae. Single cells are spherical in shape but the small group of 2-4 cells are rounded with flat opposing surfaces (D shaped). These group of cells are termed as ‘cell nests’. The nuclei of the cartilage cells are large and round with 1-2 nucleoli and the cytoplasm is basophilic. The stained sections of the cartilage show the cytoplasm shrunken from the sides of the lacunae. This is a shrinkage artifact. During fixation and dehydration the cartilage cells retract from the lacunar wall and leave a gap between them and the lacunae. The young cartilage cells are known as ‘chondroblasts’. These are smaller in size and irregular in shape due to the branched cytoplasmic processes. 2. Fibers: Fibers are fine or thick collagen fibers or branching and anatomizing elastic fibers. 3. Ground Substance It is an amorphous gel like substance. It is stained by basic dyes due to the presence of a glycoprotein (chondromucoprotein) which on hydrolysis yields chondroitin sulphates and keratosulphates. The ground substance which surrounds the chondrocytes usually stains more deeply than elsewhere. The deep basophilic rim is called the capsular territorial matrix and stains darker than the interterritorial matrix. The basophilic stain is due to strongly acidic sulphate groups of chondroitin sulphate A and C.
The classification is based on the visibility and nature of fibers in the ground substance. 1. 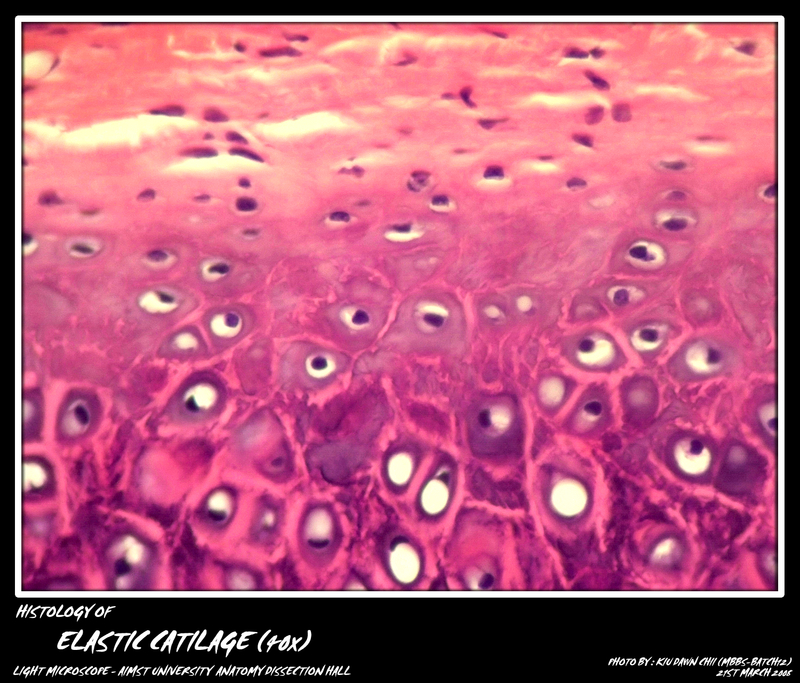 Hyaline cartilage — containing thin (invisible) bundles of collagen fibers. 2. Elastic cartilage — with branching elastic fibers. 3. Fibro cartilage — containing thick bundles of collagen fibers. It is further subdivided into 2 varieties i.e. (a) Costal cartilage is present at the ends of growing bones, ribs and in respiratory passages. It is covered by the perichondrium. (b) Articular cartilage is present at the articular ends of the bones. There is no perichondrium covering the articular cartilage. (i) Cells are encapsulated in groups of 2-6 “Cell nests”. (ii) The matrix appears homogeneous and has affinity for basic dyes. refractive index of fibers and ground substance is same. This type of cartilage has elasticity i.e. it comes back to its natural size after being stretched. It is present in pinna. epiglottis, external auditory meatus, part of arytenoid, corniculate and cuneiform cartilages. In fresh state this cartilage is yellowish in colour . (i) Chondrocytes are larger than those of hyaline cartilage and are present singly or in small groups. (ii) The ground substance contains abundance of branching and anastomosing elastic fibers. (iii) Perichondrium is present and is comprised of an outer fibrous and inner chondrogenic and vascular layer. It is also termed as white fibrocartilage and is present in intervertebral discs, pubic symphysis, intra-articular discs. 1. Most of the chondrocytes lie singly and are in smaller numbers. These are aligned in narrow rows between the thick parallel bundles of collagen fibers situated in the ground substance. 2. Perichondrium is characteristically absent in the adult fibrocartilage. Nutrition of all cartilages: The nutrition of mature cartilage is derived by diffusion from capillaries in the adjoining connective tissue or by means of synovial fluid from joint cavities. Lack of nutrition affects the cartilage adversely. Lack of vitamins and proteins results in diminished thickness of epiphyseal plate. Deficiency of vitamin C causes improper matrix, while lack of vitamin D results in excessive proliferation of cartilage with diminished ossification, leading to deformity of bones.